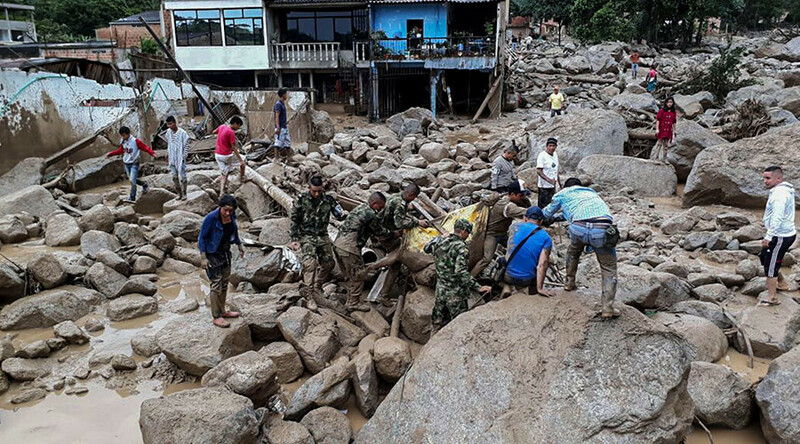 A mudslide in Mocoa, near Colombia’s southern border, has killed 234 people and left 430 people injured or missing, after intense flooding caused three rivers to burst their banks. The Colombian Red Cross told reporters at a press conference that 234 people were killed and 220 injured in the disaster. Over 200 people are missing. The death toll might be higher, as Reuters reports 254 killed, 400 injured, and 200 missing, citing an army statement. Colombian President Juan Manuel Santos told reporters on Saturday that the area had experienced 130 mm (5 inches) rain overnight, when the average monthly rainfall in Putumayo region is 400 mm. The Colombian Red Cross are currently unable to accept aid donations until a suitable staging area has been established and proper means of distribution organized. Governor Sorrel Aroca told local media that 17 neighborhoods had been damaged by the flooding, with two bridges closed and electricity supply disruptions expected to continue, hampering emergency response efforts. #DNBC Actualiza las cifras a 112 fallecidos y 190 heridos en emergencia de Mocoa/Putumayo. Dramatic footage showing the full force of the overnight flooding has emerged, showing heavy trucks been dragged down city streets. "A big portion of the many houses were just taken by the avalanche, but above all the people were warned with enough time and they were able to get out, but houses in 17 neighborhoods have basically been erased," Mocoa Mayor Jose Antonio Castro told local radio station Caracol, as cited by Reuters. Emergency workers are still searching for survivors and the death toll is expected to rise. "The figures have been going up and in the crisis room they kept reporting more dead, we hope to God that (the death toll) will not go up too much because it is very sad," Castro added. Carlos Ivan Marquez, director of Colombia’s National Risk Management service, told local media that the Mocoa, Mulato and Sancoyaco rivers burst their banks at approximately midnight on Friday, March 31st, as cited by the AP. Tragedia en Mocoa, Putumayo; por lo menos 10 muertos y 30 heridos por avalancha y desbordamiento de 3 ríos. Debris has been strewn across the city of 350,000 residents. The Colombian military are on scene to assist with evacuations and relief efforts and a state of national emergency has been declared. Así se vive a esta hora la emergencia invernal en #MOCOA, el ejército atiende esta crítica situación que enluta todo el territorio nacional. Colombian President Juan Manuel Santos expressed his condolences to the victims, his praise for the emergency services and is currently visiting the city reports the AP.